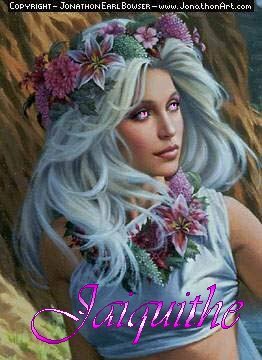 Jaiquithe, her name means "Joy of Love" and is pronounced *Jay-qui-thee*, surveys the lodge and nods her head. Everything is in order...everything is as it should be. The woman is small statured, with snow-white hair and moonstone-colored eyes. Gowned and cloaked in hues of blue and purple, she takes great pride in her charge. Homefires has been her home since she was small...the Old Ones have kept her safe, clothed, fed and loved since her parents died in a bizarre accident when she was 2. Magick came easy for her, and they taught her well; yet they never allowed her to forget that she is, after all, human. The lodge was a gift to her when she came of age with the instructions that the meadow, the lodge and all its creatures...be kept under their spell. It appears and disappears as it is needed. "In a place that isn't a place, in a time long forgotten..." When those who are oppressed or chased or that live in fear, reach the end of their rope...when they ask for and/or seek sanctuary...then Homefires is opened to them, and Jaiquithe makes them feel welcome and safe within the walls of the lodge and borders of the lands.